The Canadian Silver Maple Leaf is a silver coin that is produced by the Royal Canadian Mint. 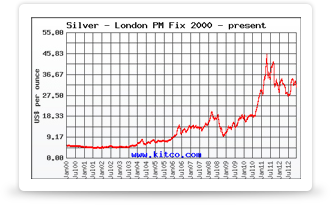 This silver, bullion coin is issued annually, and has been done so since 1988. The Silver Maple has a face value of 5 Canadian dollars which means it can be used as legal tender. However, don’t expect to find any in circulation, as despite its 5 Canadian dollar face value, the market value of this coin is much higher, going as high as 30 Canadian dollars in 2011. The coin weighs 1 Troy ounce, and the purity of the Maple is 99.99%, which is known as ultra-fine silver and the highest level of purity possible for this type of precious metal. People who are thinking of investing in precious metal coins for retirement purposes will be interested to know that the Canadian Maple Leaf silver coins are IRA-approved. This means they can be used as a way to diversify a retirement portfolio while taking advantage of tax breaks. In its first year, 1988, there were 1,062,000 of these coins minted. The amount minted each year varies, going up and down, but in the last six years or so there has been a surge in numbers minted, from just under a million in 2005, to nearly two and a half million the following year. 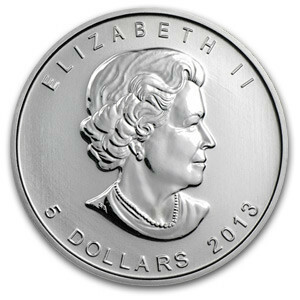 This number has been rising steadily since then, seeing 23,129,966 Canadian Silver Maple coins minted in 2011. As these coins are produced in relatively high numbers they are easy to get hold of, at least for the standard versions minted in the last few years. Sites like JMBullion.com have large selections available to buy online, ranging from standard single coins for just over $30 up to monster boxes (500 coins) for ~$16,000. When it comes to purchasing one of these silver coins, they can be bought in a variety of different pre-packaged quantities. You can buy the Silver Canadian Maple Leaf coins by the box, which consists of 20 tubes, each of which contains 25 coins, bringing the total to 500. These boxes are known as a ‘monster box’. The tubes of 25 coins are also available by themselves, and of course, the coins can be bought individually. The standard design of these coins features an effigy of Queen Elizabeth II, of which three versions have been used. They are the young head version, an old head version, and an older yet head version. On the same side you will also find the year of issue and the face value of the coin. On the reverse of the coin you will find a picture of a maple leaf. It is important to note that when it comes to the design and appearance of the Canadian Silver Maple Leaf coins, they always feature a maple leaf, although it has taken different forms over the years. As the coin is minted each year, there are often annual variations on the design. For example in 2009, there was a commemorative issue for the 2010 Winter Olympics, which was held in Canada. Something that you might notice when browsing Canadian Silver Maples is a whitish stain on the coin. This is known as a ‘milk spot’, and is a common occurrence found on many Maples. It is caused by the remnants of the cleaning detergent that is used prior to baking, which then gets baked into the coin itself. This means these white marks cannot be removed or diminished. As these are not numismatic coins, and are instead collected as bullion, it doesn’t affect their value, although some private buyers unfamiliar with the coins and this common trait might be reluctant to accept them.